St, Francis and his brothers, and St. Clare and her sisters, praised God in many different prayers. Many of these prayers are full of praise and worship. The three prayers below were all composed by St. Francis. andd your deeds are wonderful. you are the almighty King. are King of heaven and earth. you are our guardian and defender. May God turn His regard towards you and give you peace. through Mary, to follow the path of your son. 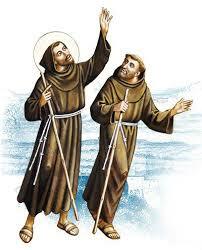 into the fraternity of the Secular Franciscan Order. Grant us, by his intercession and according to Your will, the graces we implore, hoping that Blessed Fr. Fredric will soon be numbered among Your Saints. Glory be to the father.. (three times). and the Holy Spirit, the Comforter. All the fullness of grace and every good. Feel free to select and use these prayers for your your liturgies.